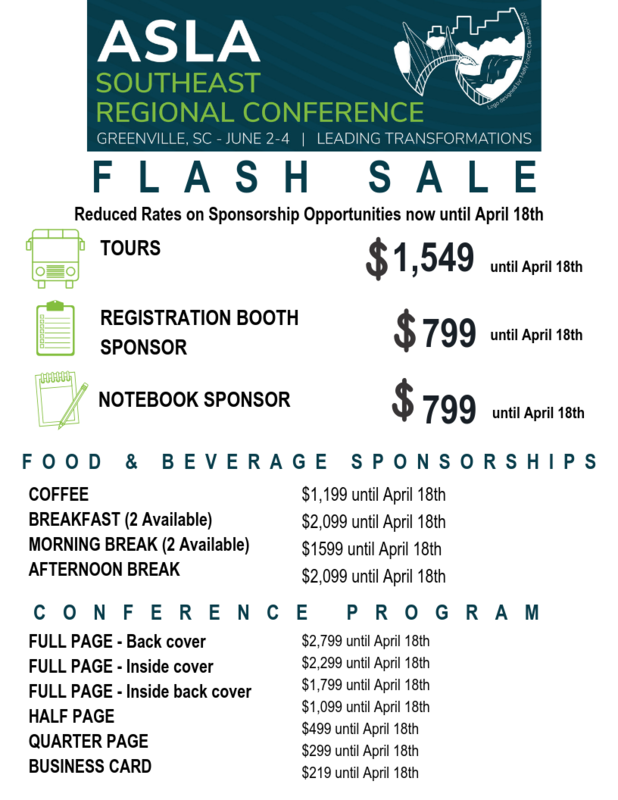 Starting today, April 11, and continuing for seven days, the Southeast Regional Conference is running a flash sale on some remaining sponsorships! Join the southeastern ASLA Chapters as we bring together Landscape Architects and Allied Professionals from the Southeast Region to one conference! Here is your opportunity to showcase your products or services to Landscape Architects, Allied Professionals and other regional decision makers throughout the southeast. This conference will provide exceptional seminars, tours and networking opportunities as industry leaders seek to learn more about your products and services. Sponsored items will be reserved upon receipt of completed registration and payment. MasterCard, Visa or Check accepted. Save big until April 18! Download the Flash Sale Form and complete it ASAP.